The products of Fuji Industries Corporation are used in various automotive parts and components. Power Window, Door, Fuel Pump Tank, Corner Sensor, etc. customers need them. This is our motto to satisfy the expectations of customers. Tubes, Waterproof Rubber Rings, etc. Quality improvement – This is Fuji Industries Corporate mission. 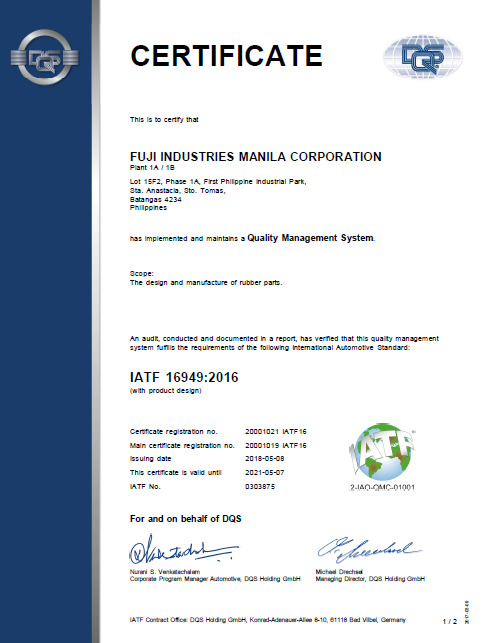 In addition to ISO9001 Certification, in 2002 Fuji Industry Corporation acquired QS9000 certification which was developed upon the request from the Big Three automakers (GM, Ford and DaimlerChrysler) and has been the de facto global standard for automotive industry. Our systems for development, sales and product quality certainly satisfy the standard of various automakers in the world. Copyright (C) 2007 Fuji Industries Corporation. All Rights Reserved.